Amazing what conclusions a free thinking and level headed person can reach. That is a good article ! But I must say, all of us at the JBF get along with John just fine ! I don't know what's wrong with the rest of the world ! Will admit, tho -- drawing a blank. Who is this? I discover about her in "Lying in the Gutters" when she wrote a poignant story about herself " Good-Bye to comics " a year ago or so and followed her blog since then. She worked at DC for some times. Her name is Valerie D'Orazio. She's a former editor for Acclaim and DC. She is also current national president of Friends Of Lulu. Wait -- did she work for Mark Chiarello? I live in a vaccuum, as I guess I find this Forum to be one of the most honest, straight-forward and intelligent places to interact online. I didn't know we were all viewed as baboons with our asses hanging out. Not that I much care, but are we collectively a topic of discussion among the "cognoscenti" of the Internet? short hop to dissing those who don't dis me for the same effect. Eww, Lying in the Gutters. Rich Johnston is the Joan Rivers of comic books. 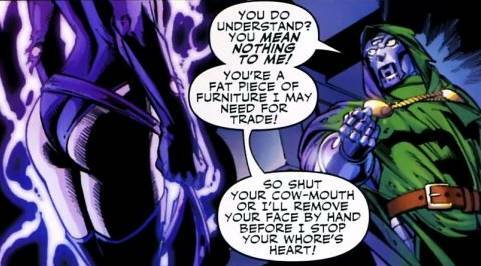 Mighty Avengers where Doctor Doom is calling Ms. Marvel a fat whore?!!? So misogyny is back full swing in comics again eh? manner in a superhero story is some kind of "high art". "Doctor Doom is calling Ms. Marvel a fat whore?!!? So misogyny is back full swing in comics again eh? " Not just misogyny. It's totally out of character for Doom. He might kill her or rant about her (or anybody else's) inferior intellect, but he'd never stoop to such a base insult. The only "Byrne" comments I hear at my LCS are the classic "the old stuff was better" (as I buy a new Byrne book). I usually just respond with, "no, art is art - the older stuff was just different". I don't know anyone who has actually met Mr Byrne, so I've now other stories. That is a nice article, though. stoop to such a base insult. That's an absolute "given" if I've ever heard one. Going for the throat of women in comics gets my goat first. is why I don't read anything by them 'cept BND: Spider-Man these days. Nice blog and great reflection on Mr Byrne. From what I see on this forum pretty right on. I think Doom can be a misogynist. He is definitely a sociopath. But the dialog ... oh gods. I am so glad I only read Uncle Scrooge comics now. Who wrote that crap? I want to make sure I never buy one of their books. This reflects a pattern that I've noticed for the year or so: a dearth of Bad-Byrne moments. Both off and on the JBF.